Fairview Place Historic District boundaries are roughly: Encanto Boulevard to McDowell Road, between 15th Avenue and 17th Avenue. 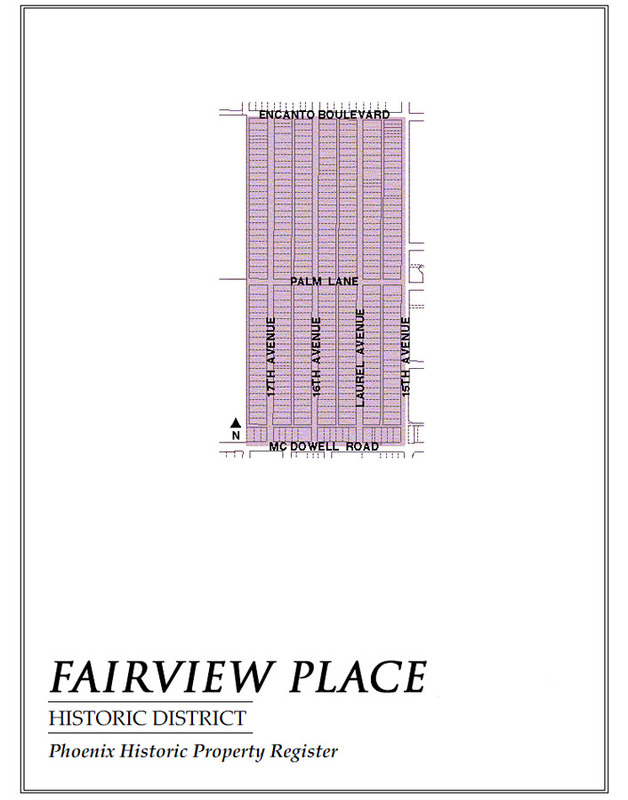 Fairview Place, as the name implies, is neighbor to the Arizona State Fairgrounds. This makes for impressive Fairview sunsets— with the elegant Veteran’s Memorial Coliseum in the foreground year-round and the added interest of a soaring Ferris Wheel from time to time. The State Fair brings a 3-week burst of activity each fall and the County Fair brings a 3-day spring microburst to this otherwise calm urban neighborhood which still retains the original suburban vibe of its early days. There are 300+ well-built homes in Fairview Place, all with east-west orientations facing the four avenues that make up this distinct historic district. 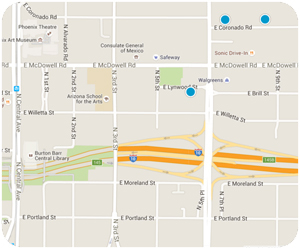 One of the first things you may notice is the absence of cross streets. The longer-than-usual north-south city blocks are broken only by Palm Lane at the district’s midpoint, giving this neighborhood its own unique rhythm and flow of pedestrians and cars. Fairview Place began with a handful of Period Revival homes in the late 20s but the majority of Fairview homes were built from the late 30s to the late 40s when Ranch was the prevailing home style. That Ranch might be Transitional or French Provincial or Spanish Colonial Revival, but you get the picture—these are modest homes (averaging 1100 square feet, typically with 2 bedrooms and 1 bath) that were built with an attention to detail and quality that withstands the test of time. If only it were a few years younger, Fairview might as easily have been named “Parkview.” The beautiful Encanto Park, one of the oldest and largest in the city of Phoenix, was developed on the east side of 15th Avenue in 1935. The stately homes of the Encanto-Palmcroft Historic District lie directly east too. To the north of Fairview Place, the park-like Del Norte Place Historic District is another great neighbor. And on the south side of McDowell Road, the once neglected Franklin School has been carefully restored and put back to use as a high school for kids interested in careers with the police and fire departments. If you are looking for a small-footprint close to downtown but prefer a suburban feel, Fairview may be your place. The neighbors, a friendly and involved bunch who organize a home tour for the public in November and cozy social gatherings for themselves throughout the year, deserve as much credit as the homes do for making Fairview Place Historic District a great neighborhood to call home. Talk of relocating the fairgrounds….